Fantastical stories of rockstar magicians, murderous gloves, bouncing boy terrors, vengeful plush pigs, blue tinted butlers, and a Little Tiny Doom set in an opulent quasi-historical world of magick and high manners that bears a striking resemblance to Gold Rush California. 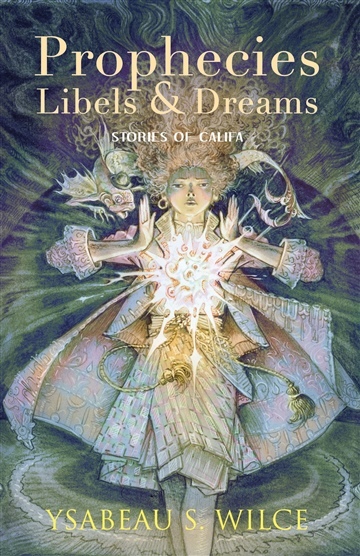 These inter-connected stories are set in an opulent quasi-historical world of magick and high manners called the Republic of Califa. The Republic is a strangely familiar place—a baroque approximation of Gold Rush era-California with an overlay of Aztec ceremony—yet the characters who populate it are true originals: rockstar magicians, murderous gloves, bouncing boy terrors, blue tinted butlers, sentient squids, and a three year old Little Tiny Doom and her vengeful pink plush pig. By turn whimsical and horrific (sometime in the same paragraph), Wilce’s stories have been characterized as “screwball comedies for goths” but they could also be described as “historical fantasies” or “fanciful histories” for there are nuggets of historical fact hidden in them there lies.